There are three types of teals seen in Cuba. The Green-winged Teal and Blue-winged Teal can be located over much of the island in the winter months. The Cinnamon Teal nest in the central US states] and along the southern Canadian Praires. It is the rarest of teals to be seen among this group. 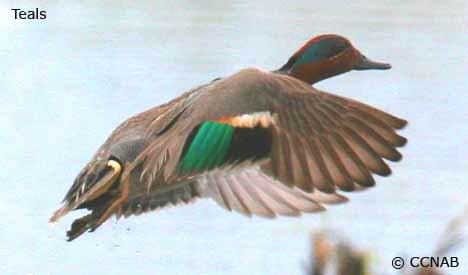 All three teal species would be considered migrants. The teals mostly prefer shallow waters and mudflats where they dabble for their food and sift through the sediments for forms of life. The male teals changes from a dull plumage in its non-breeding cycle to a bright and colourful plumage with many distinct markings, when in its breeding plumage. The females remain in plain coloured plumage year-round.